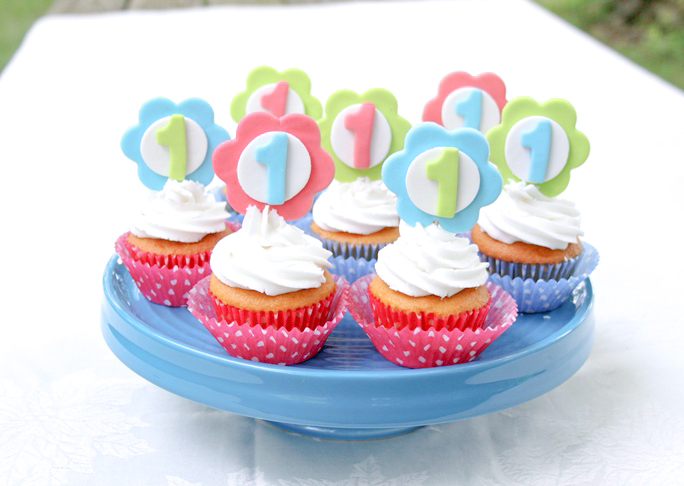 Are you looking for a fun first birthday cupcake idea that’s easy to make and loaded with fun colors? 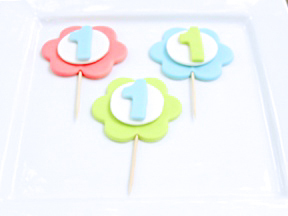 Check out these DIY first birthday fondant cupcake toppers. They’re easy to make, but they’re sure to dazzle your party guests. Step 1: A day or two before you’re ready to decorate the cupcakes, color a large golf ball piece of gum paste pink by adding a few drops of food color. Pull and twist the gum paste to work the pink color through until it is evenly colored. Repeat the process to color a large golf ball size piece of gum paste blue, and another one green. Store the gum paste in a plastic bag when you’re not using it to keep it from drying out too quickly. Step 2: Roll out the pink gum paste, and use the daisy or rosette fondant cutter to cut out 8 rosettes. Repeat the process to cut out 8 green, and 8 blue rosettes. Step 3: Re-roll the pink gum paste and use the 1 inch “1” fondant cutter to cut out 8 pink 1’s. Repeat the process to make 8 blue and 8 green 1’s. Step 4: Roll out a large golf ball-sized piece of white gum paste. 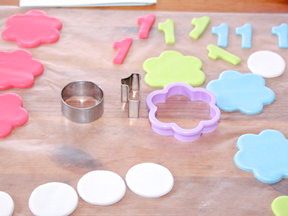 Use the 1 inch circle fondant cutter to cut out 24 one inch circles. Step 5: Place a gum paste circle in the center of each rosette. If the rosette doesn’t stick, use a tiny drop of water to wet the center. Step 6: Place a “1” in the center of each circle. Mix up the colors so the 1’s are a different color than the rosette. Step 7: Carefully insert a toothpick into the bottom of each rosette and set the first birthday cupcake toppers aside to dry for a day. Step 8: Bake your cupcakes according to package directions, or purchase pre-baked cupcakes. Step 9: Decorate the cupcakes with white icing. Add the icing to a pastry bag with a Wilton 1M large star tip on the end. 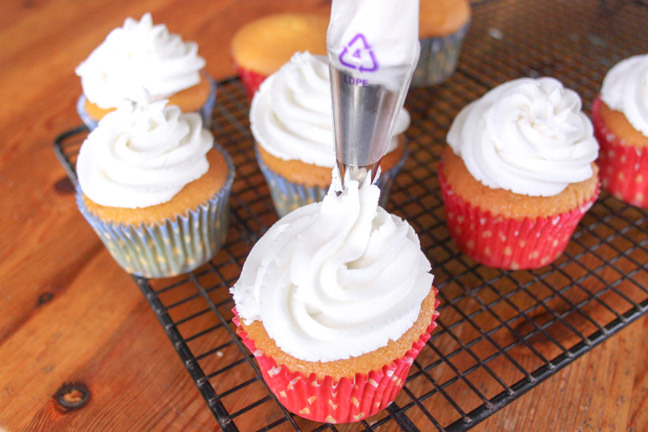 Squeeze the bag gently while swirling the tip around in circles from the outside to the center of the cupcake. 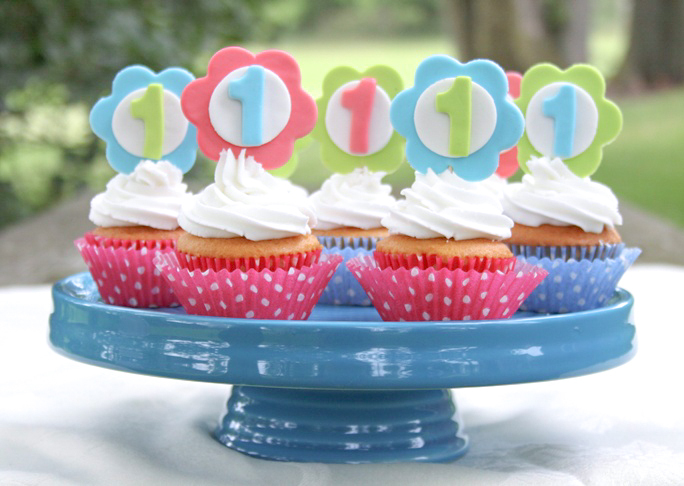 Step 10: Insert one first birthday cupcake topper into the top of each cupcake.